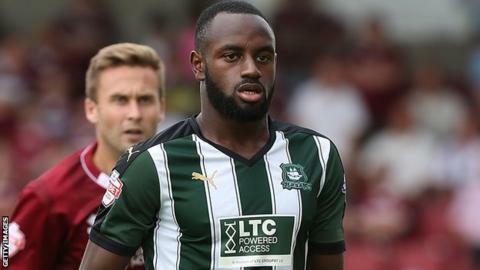 Hiram Boateng says his time at Plymouth Argyle is helping him develop. The 19-year-old midfielder is on loan to the Pilgrims from Crystal Palace until January and has been an ever-present in the Argyle line-up. "This is my first proper stint of first-team action," said Boateng, who played once on loan at Crawley in 2014. "In the under-21s you're not playing for anything, here you're playing for the three points and people's livelihoods are at stake." Boateng's only Crystal Palace experience has come in the FA Cup, starting in their 4-1 third-round loss at Stoke in 2013 and the 2-0 win at West Brom at the same stage of the competition a year later. "Every game's been a tough test and challenge, but the players alongside me have helped me to get through games," Boateng added to BBC Radio Devon. "This is just the beginning for me and something like this is exactly what I needed. "In the long run it's going to toughen me up, it's going to give me the experience I need. "All I want to do is get out on the pitch and play, and Plymouth Argyle have given me the opportunity to do that."